Joseph Manske was born on April 13, 1921, in Gowanda, New York. He enlisted in the U.S. Army Air Corps on September 30, 1939, and attended Airplane Mechanic School at Chanute Field, Illinois, from September 1939 to July 1940. His first assignment was as a B-25 Mitchell aircraft mechanic with the 95th Bomb Squadron of the 17th Bomb Group at March Field, California, from July 1940 until he was selected for the Doolittle Mission in February 1942. Sgt Manske was the engineer/gunner on the 5th B-25 to take off from the aircraft carrier USS Hornet (CV-8) on April 18, 1942, and after bombing targets in Tokyo the crew bailed out over China when their aircraft ran out of fuel. After returning to the United States in August 1942, he attended Officer Candidate School and was commissioned a 2d Lt in the U.S. Army Air Forces at Miami Beach, Florida, on December 9, 1942. Lt Manske next served as an Aircraft Maintenance Officer with the 311th Bomb Squadron at Key Field, Mississippi, and then in North Africa from December 1942 to October 1943, followed by service as an Aircraft Maintenance Officer with Training Squadron 3 and then with the 445th Bomb Squadron in North Africa and Italy from October 1943 to August 1945. Capt Manske served as an Aircraft Maintenance Officer with the 112th Army Air Force Base Unit at Westover Field, Massachusetts, from August 1945 until he left active duty and joined the Air Force Reserve on April 1, 1946. He next joined the New York Air National Guard on December 8, 1948, and served with the 107th Maintenance Supply Group from December 1948 until he returned to active duty in the U.S. Air Force on March 1, 1957. Lt Col Manske's next assignment was as Special Assistant for Air National Guard Affairs with Headquarters Mobile Air Material Area at Brookley AFB, Alabama, from March 1957 to January 1961, followed by service as Air Force Logistics Command Special Assistant for Air National Guard Affairs with Headquarters San Antonio Air Material Area at Kelly AFB, Texas, from January 1961 until he returned to reserve status with the New York Air National Guard on November 15, 1966. 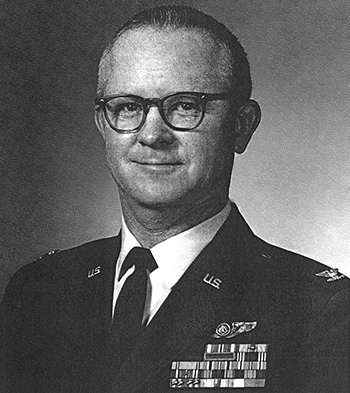 After serving for a year as a Staff Officer with the New York Air National Guard at White Plains, New York, Col Manske returned to active duty with the Air Force on November 16, 1967, and then served as Special Assistant for Air National Guard and Air Force Reserve Affairs with Headquarters U.S. Air Force in the Pentagon from November 1967 to July 1970. His final assignment was as Special Assistant for Air National Guard Affairs with Headquarters San Antonio Air Material Area at Kelly AFB from July 1970 until his retirement from the Air Force on February 1, 1973. Joseph Manske died on April 4, 1998, and was buried at the Fort Sam Houston National Cemetery in San Antonio, Texas. 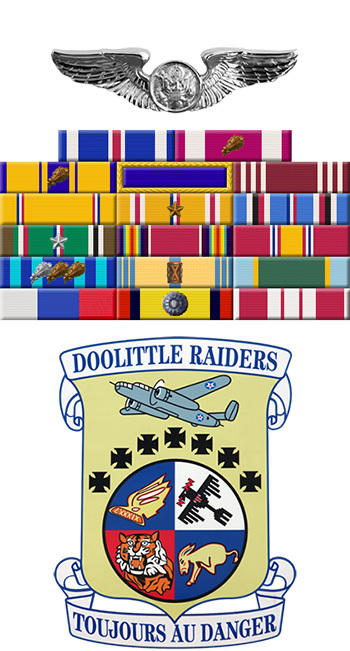 For extraordinary achievement while participating in a highly destructive raid on the Japanese mainland on April 18, 1942. Sergeant Manske volunteered for this mission knowing full well that the chances of survival were extremely remote, and executed his part in it with great skill and daring. This achievement reflects high credit on Sergeant Manske and the military service. 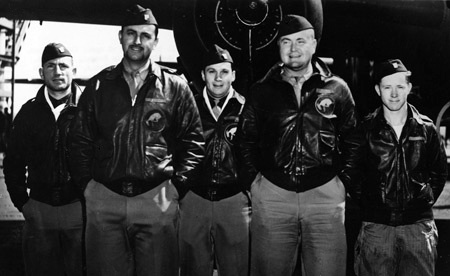 Crew 5 of the Doolittle Raiders, left to right-Lt Eugene F. McGurl, Capt David M. Jones, Lt Denver V. Truelove, Lt Ross R. Wilder, Sgt Joseph W. Manske.